With RealPlayer Cloud, Xbox One users now have another option for streaming their personal video collections to the console. The new app lets users access videos that they've uploaded to RealPlayer's cloud storage service, or have stored on other connected devices with RealPlayer Cloud installed. The app supports a wide range of file types, including FLV, WMV, MKV, DIVX, XVID, MOV, AVI, and MP4, and handles all the necessary formatting to ensure that videos will run on the console. Users can also share videos with other users, and if you have RealPlayer's app installed on other devices, it supports picking up on a video from where you left off. The Xbox One version supports several of the console's unique features, such as Snap view, motion controls and Kinect voice commands. Later this fall, users will also be able to upload their recorded gameplay videos to RealPlayer Cloud, so they'll be instantly available through other devices. Why this matters: RealPlayer Cloud isn't the only way to stream personal video collections to the Xbox One. Plex already offers a similar app for streaming video from the cloud and connected devices, but the way it works is a bit different. The new app just gives users an additional choice, so they can pick the plan that works best. With RealPlayer, you get 2 GB of cloud storage for free. Paid plans normally start at $2 per month for 10 GB, and go up to $30 per month for 300 GB. But right now, the company is offering a promotional 365 GB plan for $5 per month, and says users who sign up will get that price for life. Plex doesn't offer its own cloud storage, but it can sync video files through third-party services such as Box, Copy, Dropbox and Google Drive. It's a more complex setup than RealPlayer, but also more versatile if you'd rather put all your cloud eggs in one basket. And while Plex doesn't do cloud storage, it does currently require its own $5 per month Plex Pass subscription to function with the Xbox One. The company does plan to offer a paid Xbox One app without the subscription, mirroring the paid client app model Plex offers for other platforms, but it likely won't include cloud syncing. This isn't an issue if you're only planning to stream directly from other devices on the same network. Keep in mind that the free version of RealPlayer Cloud has one gotcha of its own: The company's SurePlay feature, which automatically format video to the appropriate size and bitrate, only works in standard definition unless you upgrade to a subscription. The bottom line is you'll likely want to cough up some money one way or another. If you don't mind being tied to a subscription, RealPlayer seems like the way to go, while Plex makes more sense if you want to bring your own cloud storage or only plan to stream over a local network. 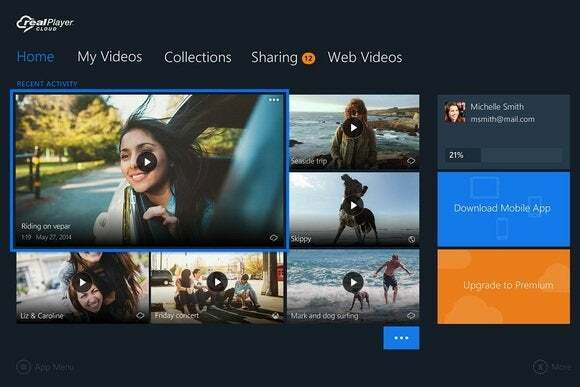 Of course, if all you're doing is watching homemade videos from your phone, you might instead consider uploading them to OneDrive, which includes 15 GB of free storage, and viewing them through the free Xbox One app.